With VISBO companies get rapid visibility and overview of their project data helping to keep all people on the same page. VISBO’s unique approach is to connect to existing planning systems such as Excel, Microsoft Project, Oracle Primavera, etc. and present that information in VISBO Reports which are able to automatically synchronize with the database. Thus companies gain an unheard of ability to communicate always-up-to-date project information to both internal and external project members and stakeholders. 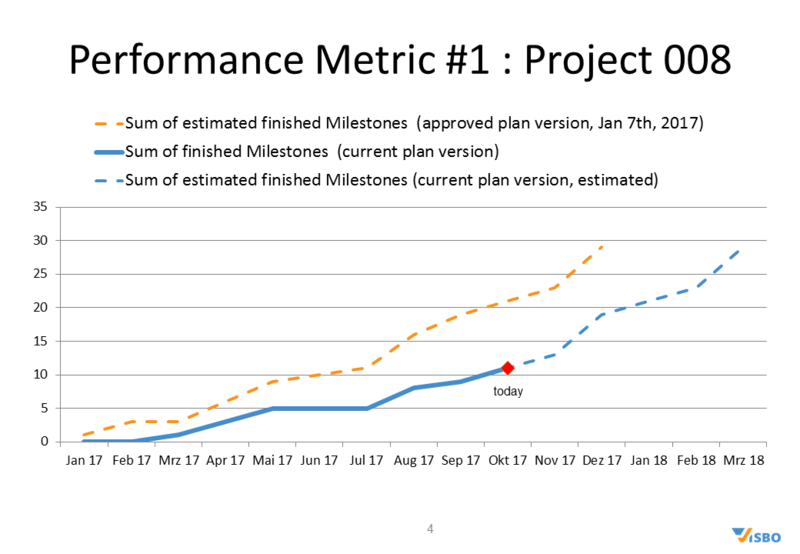 The potential benefit: project managers and PMO members never again need to create nor manually update and distribute reports again and again. Lots of man-hours are now free to be used much more efficiently than repeatedly drawing and distributing reports. VISBO empowers organizations to execute with greater agility, speed and accountability. Lean Reporting: Create reports just once. Reports which are able to update themselves. According to a PMI study one of the main reasons projects fail is inefficient project communication. 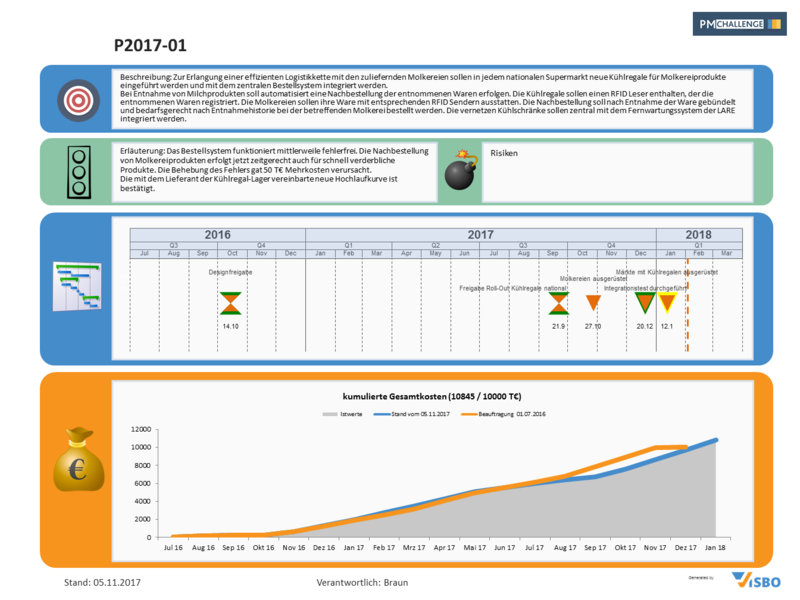 VISBO Lean Project Reporting helps to change that: everybody receives current and relevant project information. Always. For the whole duration of the project. No matter what planning tool is used. Lean Analysis: find and resolve project bottlenecks. 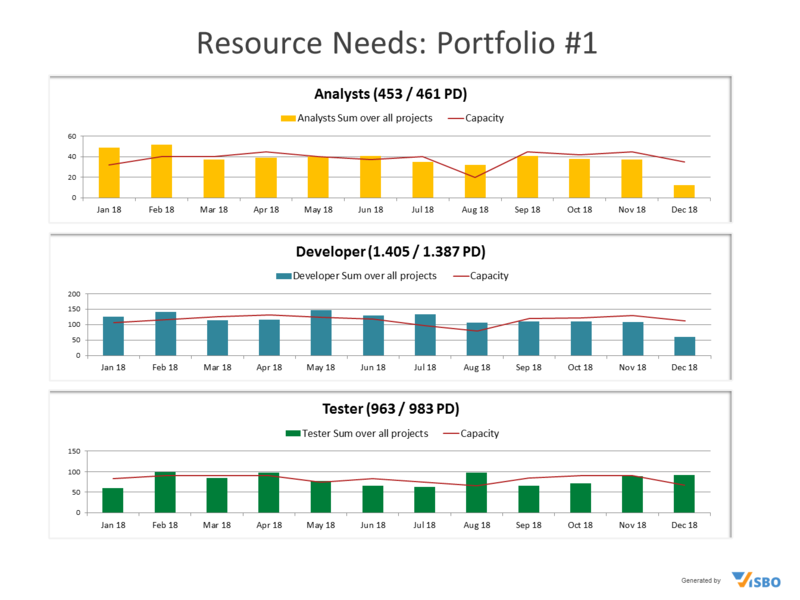 Easily find out looming resource bottlenecks even within hundreds of projects. Create project- and portfolio variants and perform what-if-simulations in order to eliminate bottlenecks. Easily find out how projects and portfolios changed over time and compare performance key-indicators for projects and portfolios. VISBO is able to import data from various sources such as Excel, Microsoft Project, Oracle, SAP and other formats. Reports and information sheets are just created once. No need to update reports any more, because VISBO reports are able to update themselves. Even portfolios with hundreds of projects are visualized, analyzed and reported on-the-fly. VISBO delivers measurable benefits within days. Go challenge us!